So - what color Lamy Safari did you HAVE to have? Until the Dark Lilac came out I would have picked the red Safari, but it has been deposed! Yellow. Warm and inviting, matched with blue ink or a dark purple it is fabulous. I have others but this is what I have longed for. Charcoal is my favourite and I own couple of these. Edited by prashant.tikekar, 22 July 2016 - 14:55. My first was gifted to me by two young ladies who think I should 'lighten-up'. Paired with a Turquoise ink, I feel as if I could become airborne. Edited by Sandy1, 22 July 2016 - 20:36. I only have one, and that's the Dark Lilac. HAD to have that one. I thought, when I decided to actually break down and get a Safari that I wanted one of the pink ones (I mean pink, not coral) but everyone I saw looked really kinda cheesy. Happy now that I waited for the Dark Lilac. I'd have to see the new LX colors in person before deciding if I liked any of those. That's not Kung te cheung, is it? I thought it was darker. On any pen and anything... Yellow!! A 2000 in Charcoal Makarolon would be nice too. Yes, it is a tad darker than shows in this photo. It's just the sunlight hitting the page...and the exposure. I would always suspect the shade of an ink in a photo where the pen is the focus of attention, as generally the image would be exposed to acheive a good representation of the pen, and not the ink. Having said that, the Kung te-Cheng I have, seems to come out a lot lighter than most reviews I have seen. Maybe my bottle needs a really good shake up?! My wife has a charcoal one, which is OK. I have thought about bright yellow for fun. Normally, I am not so much buying pens for looks, but for writing experience first. 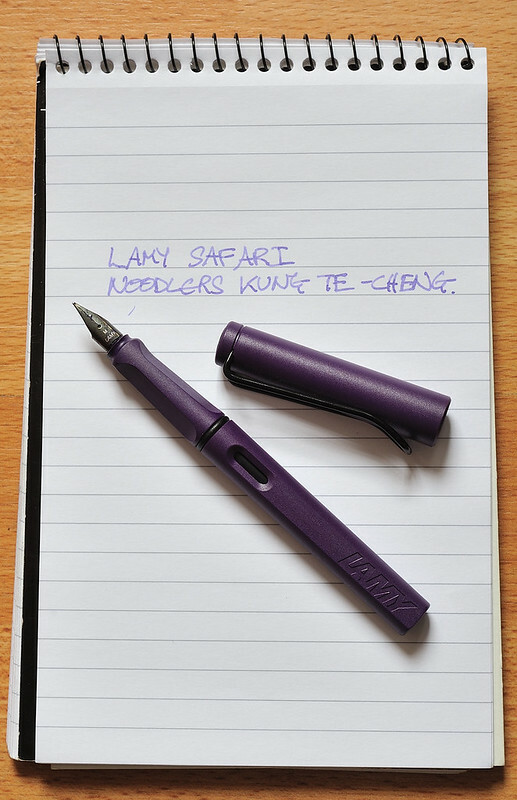 So I now have that Dark lilac one, and I doubt if I will be buying another Safari soon. Same, I have the Copper Orange AlStar, happy with it, don't need another one.